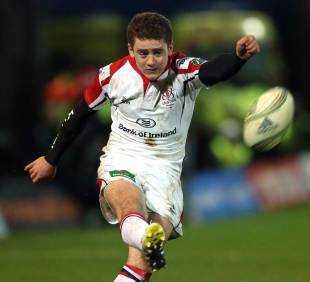 Ulster duo Luke Marshall and Paddy Jackson will make their debuts for Ireland after being named in the XV for their match with Scotland on Sunday. Ireland boss Declan Kidney has also handed starts to Keith Earls, Tom Court and Donncha O'Callaghan as they look to bounce back from their round two loss to England. Marshall comes into the side in place of the injured Gordon D'Arcy, who is carrying a foot injury, while Jackson gets his chance with Jonathan Sexton sidelined. Veteran No.10 Ronan O'Gara was also in the mix to start at fly-half, but Kidney has opted to give the 21-year-old his chance. "Paddy's inclusion was a challenge given the stature of Ronan O'Gara, but I think Paddy deserves a go in this one," Kidney said. "It was a very difficult decision to leave Ronan out, it was right up there. But that's a compliment to Paddy. "There were always going to be five changes to the side that played against England. Luke was with us all through November and accomplished himself very well." And elsewhere in the backs, Earls starts on the flank replacing the injured Simon Zebo. Earls last started for Ireland during the November Tests but that was in the centres. In the pack, with Cian Healy suspended for his stamp on Dan Cole in their match on February 10, Ulster's Court gets his chance to impress. He has found his chances to start for the national team limited due to Healy's form and while Sunday's game will be his 30th cap, it will be just the seventh time he has been named in the Test XV. O'Callaghan gets his chance to shine in the second-row with Mike McCarthy ruled out due to knee ligament damage. He will bring a wealth of experience to the team and will win his 93rd Ireland cap on Sunday. Kidney has also opted to shuffle his pack on the bench. While the front-row remains the same, Devin Toner comes in for O'Callaghan and Ulster's Iain Henderson replaces the injured Chris Henry. And Luke Fitzgerald could also win his first cap for Ireland since 2011 having missed much of the last 18 months due to injury. Operation over & all went smooth- thanks for all the kind msgs. So gutted to b out for a while but the race to twickenham is on!